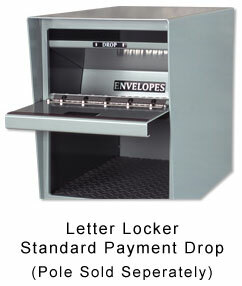 The American Made Letter Locker has set the standard for the industry. It is the highest security mailbox available. Made of 14 and 16 gauge electro-galvanized steel with a one piece welded tubular frame makes the Letter Locker resistant to the harshest vandals. With a LIMITED LIFETIME WARRANTY through the manufacturer, you are assured that this is the last mailbox you will ever need. The one inch incoming mail slot makes it virtually impossible for thieves to steal mail through this opening. Heavy-duty construction from 14 gauge electro-galvanized steel. With LIMITED LIFETIME WARRANTY this could be the last mailbox you'll ever need. 14 gauge (Standard) or 10 gauge (Maximum) electro-galvanized steel to ensure security and vandal resistance.